The harbour backdrop of Singapore provided an industrial edge. On our review day you could cut the humidity with a sword. The Grand Banks Aleutian 55 is well set up for trips to nearby Malaysian islands, Thailand’s west coast, or further afield. The traditional ‘trawler-style’ hull hides cutting edge construction methods. Grand Banks director Hank Compton showed us through the factory where every element of the boats is carefully constructed. This striking Grand Banks Eastbay 55 can hit 33kts when pushed. The unmistakable sleek lines of a Palm Beach 65 in build. Palm Beach Motor Yachts joined forces with Grand Banks last year, so field editor Ben Keys went to Malaysia to discover what that means for both brands. 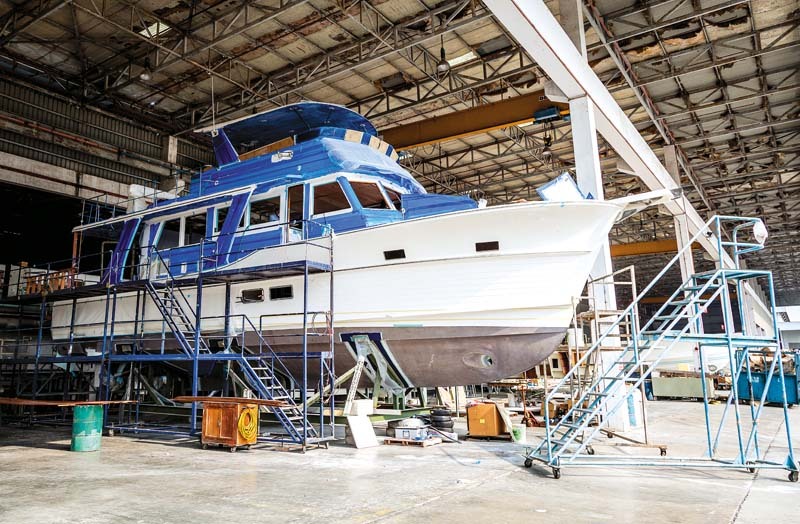 CEO Mark Richards has helped integrate big changes in how GB yachts are constructed at the 15ha factory, and this also means Palm Beach yachts now enjoy the benefits of a much larger production facility. Ben also jumped on board the new Grand Banks Aleutian 55 for a boat review – stay tuned for that report. See the full report on the behind the scenes visit to the Grand Banks facility in Johor Bahr, Malaysia.